A virtually square cloth has narrow bands as borders; all bands have the same design of linked triangles worked in double running stitch, and fine cross stitch borders, but the colour of each alternates between medium and dark blue. All four sides have a rolled hem whipped with flax thread. The embroidered bands on this linen square are worked in a double-sided stitch, reinforcing the impression that it is the equivalent of today's pocket handkerchief. At this period valued objects were wrapped in a sleeve kerchief, mandil kumm, and kept safe in the wide sleeves of garments which acted as pockets. 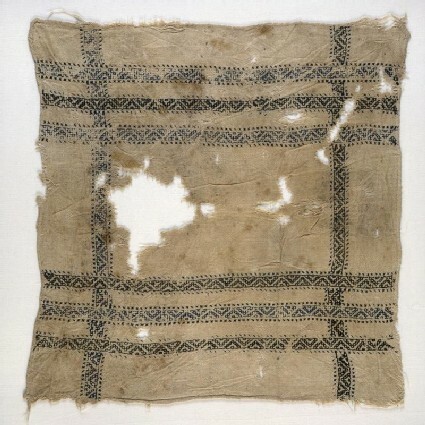 According to a record saved from the Cairo Genizah hoard of documents, one sleeve kerchief was considered sufficiently important to be listed in the dowry of a bride who lived in mid-12th century Fustat (now in southern Cairo). 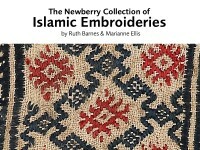 Other references to sleeve kerchiefs make it clear that they were made for sale in the late 12th century; a record dated 1225 specifies that a sleeve kerchief sold in the bazaar of the clothiers was embroidered.